The Samdani Art Foundation has confirmed the programme for the second edition of the Dhaka Art Summit, a pioneering initiative for South Asian art which brings together artists, curators, galleries and visitors from across Bangladesh and the world. A major non-profit platform, the event was conceived to support museum-quality exhibits in Bangladesh, the development of South Asian art and international artistic exchange. Launched in 2012, the first edition attracted more than 50,000 visitors, and renewed international focus on South Asian contemporary art practices. The second edition will present a panoramic survey of artists from South Asian countries including Afghanistan, Bangladesh, India, the Maldives, Myanmar, Nepal, Pakistan and Sri Lanka. Featuring internationally acclaimed figures as well as emerging talent, the programme will comprise: solo projects, curated exhibitions, an ambitious public art project, a talks series, performances, experimental film screenings, and presentations by 33 local and international galleries. 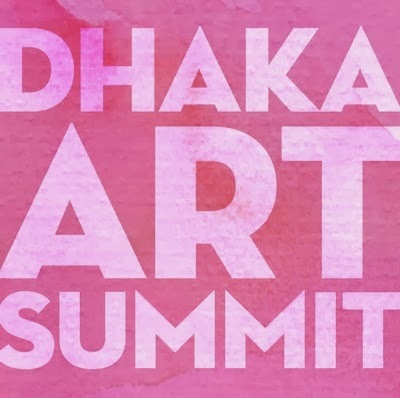 An initiative of the Samdani Art Foundation, Dhaka Art Summit is organized in collaboration with the Bangladesh Shilpakala Academy, the country’s national academy of fine and performing arts. The second edition is supported by the British Council, the Goethe Institut, Alliance Française, Swiss Pro Helvetia and the Bangladeshi artist collective Britto Arts Trust. This year, the Samdani Art Foundation has also collaborated with the Delfina Foundation (London) to award an outstanding young Bangladeshi artist the opportunity to attend a three-month residency at the Delfina Foundation in London as part of the bi-annual Samdani Art Award. A respected international jury for the prize includes Aaron Cezar (Founding Director, The Delfina Foundation), Jessica Morgan (Curator, Tate Modern and Artistic Director of the 2014 Gwangju Biennale), Adriano Pedrosa (Independent curator, editor and writer), Sandhini Poddar (Associate curator, Asian art, Guggenheim Museum) and Pooja Sood (Director, Khoj International Artists' Association). PROGRAMME HIGHLIGHTS Under the direction of Diana Campbell Betancourt (Artistic Director, Samdani Art Foundation) and Mahbubur Rahman (Artist /Co-Founder, Britto Arts Trust, Bangladesh), the Dhaka Art Summit offers a unique opportunity to explore regional and global perspectives on South Asian art practices. The second edition will also create a platform for curatorial exchange and dialogue. Solo Projects: 14 artists of international critical acclaim will present projects responding to Dhaka including Lida Abdul, Rana Begum, Rathin Barman, Shilpa Gupta, Runa Islam, Jitish Kallat, Tayeba Begum Lipi, Naeem Mohaiemen, Mahbubur Rahman, Rashid Rana, Mithu Sen, Tsherin Sherpa, Shahzia Sikander and Asim Waqif. Summit Sessions: Leading global thinkers will participate in a series of talks about institutional collecting and support for art from the region including: Dr. Ziba Ardalan (Director/Curator, Parasol Unit, Foundation for Contemporary Art), Richard Blurton (Head of South Asian Section of the British Museum’s Asia Department), Aurélien Lemonier (Curator, Centre Pompidou) and Sheena Wagstaff (Chairperson, Department of Modern and Contemporary Art, Metropolitan Museum of Art). The Samdani Art Award exhibition will showcase the works of shortlisted emerging Bangladeshi artists selected by a respected panel of international curators. The Samdani Art Award aims to support, promote and highlight contemporary artists from Bangladesh between the age of 20-40. Meanwhile Elsewhere is the title of a ground-breaking public art initiative created by Raqs Media Collective, and curated by Diana Campbell Betancourt, which will transform 160 road signs and billboards across the city of Dhaka using faces of clocks and the Bengali language. The project will be launched at the Dhaka Art Summit and will continue to be on view during Bangladesh’s International Mother Language Day on 21 February 2014. Film & Performance: An exciting line-up of experimental film and performance art curated by Mahbubur Rahman will showcase the works of CAMP, Nikhil Chopra, Htein Lin, Bandu Manamperi, Aung Min Min, Sunil Sigdel, Arko Sumon and more. Gallery Presentations: 33 leading international artist organizations and galleries including Britto Arts Trust (Dhaka, Bangladesh), Drik Gallery (Dhaka, Bangladesh), Experimenter (Kolkata, India), Jhaveri Contemporary (Mumbai, India) and Project 88 (Mumbai, India) will support this edition of the Dhaka Art Summit with presentations of South Asian contemporary art as part of the programme. Diana Campbell Betancourt, Artistic Director, Samdani Art Foundation, commented: “The Samdani Art Foundation has created a unique platform for the region, supporting visionary South Asian artists to share their work with Bangladeshi audiences, creating a place for the world's best international institutions to engage with art from the region, and providing Bangladeshi artists support and exhibition opportunities, enabling them to achieve local and international recognition and artistic growth”.